If some sceptics are now sounding its death knells, then we do well to remember their premature ringing many times before. This horseman may be riding for an apocalyptic fall, but ride on he does; and with tremendous institutional inertia in the science, the science funding and energy policy. That this scare continues to evolve is all too evident when we consider that there has never been a greater impact on energy policy for major economic players like Germany, Britain and Australia. And this impact is in direct opposition to what would be our agreed economic, political and security interests if there were no scare. Make no mistake, this is a major social phenomenon, the full power of which we are only coming to appreciate as it arises stronger from every successive blow to its credibility. The opening weeks of the summer of 1988 was when greenhouse warming arrived as a geo-political phenomenon. In the USA, the foundation event is usually seen to be NASA scientist James Hansen’s congressional testimony on 23 June, where he called for immediate action based on a 99% statistical certainty that the warming is already happening now. Hansen’s performance was a well-orchestrated part of the Dukakis presidential campaign. But Dukakis was defeated. And so perhaps more important was the responding commitment to greenhouse action by the presidential victor, George Bush (senior). Late in his campaign, Bush famously suggested that he would combat the greenhouse effect with the ‘White House Effect’. Once elected, Bush proved an enthusiast for climate action, although a treaty would have to wait; he agreed with that other conservative enthusiast, Margaret Thatcher, that treaty talks should only commence after completion of an assessment by an UN intergovernmental panel, the IPCC. The British and US diplomats had to fight hard against the impatience for immediate action that arose like a thunderous tide in the wake of Toronto. Before Toronto, while enthusiasm for global environmentalism was peaking, greenhouse warming was no leading concern. Air pollution had long been on the campaign agenda and the Toronto conference was called to address those pollutants of global consequence. It was only during the conference that greenhouse came to the fore. The majority of the folks invited to Toronto were scientists, only a handful of whom had raised concerns previously. The environmental NGOs also sent delegations, but it would be some time before greenhouse warming was raised high on the agenda for any of them. What first brought media interest to this Canadian conference was the strong ministerial representation among the delegations from 46 countries. The 29 government ministers included the two Prime Ministers who opened the conference: Canada’s Brian Mulroney and Norway’s Gro Brundtland. Brundtland had been returned to power after completion of the UN Sustainable Development report that bears her name. Canada’s Minister for the Environment Tom McMillan (left) with the two prime ministers who opened the Toronto conference, Gro Brundtland (Norway) and Brian Mulroney (Canada). The Brundtland Commission submitted its report to the UN General Assembly with much fanfare in 1987. Our Common Future, as it was titled, included calls to shift towards Sustainable Development on all its complex and varied fronts. The Canadian government’s special interest was air pollution, and so it organised their ‘Changing Atmosphere’ conference in a collaboration with the UN Environment Programme to specifically address the management of the atmosphere as a global ‘common’. At the time, Brundtland and others were calling for a general ‘law of the air’. A ‘law of the air’ was envisaged on the model of a ‘law of the sea’, but progress towards agreement on that treaty remained bogged down in negotiations over the funding of ‘technological transfer’ to poorer countries. With so much complexity already introduced into the matter of atmospheric pollution, in the end agreement on a general law seemed just too ambitious. Better to focus on individual concerns. The Toronto conference would emphasis three pollution effects on the global atmosphere: acid rain, ozone layer depletion and climate warming due to carbon dioxide emissions from the burning of fossil fuels. After this last issue came to dominance, one scientist-activist famously dubbed Toronto ‘the Woodstock of CO2’. Why greenhouse? Why carbon dioxide? The reasons are not as straightforward as they may seem in hindsight. For example, Why not acid rain? After all, this was the issue that Prime Minister Mulroney emphasised in his opening address, and it remained the cause of international tension while major polluters such as the UK and the USA had refused to commit to an emissions reduction treaty protocol. Perhaps acid rain was not a sufficiently global problem, and the threat was not sufficiently catastrophic in its imaginings. As for the ozone threat, it continued to capture geo-political attention, but anxieties had been mollified by the 1987 Montreal Protocol for ozone layer protection. Indeed, the triumph of that agreement to curb CFC emissions imbued the new campaign with confidence that a more ambitious agreement on carbon dioxide could be realised. As it happened, the course of the negotiations to protect the climate would soon follow the path of acid rain and ozone protection; that is, from agreement on a convention ‘framework’ towards agreement on an emissions reduction ‘protocol’. Whatever the cause, there was no doubt about the effect: coming out of the Toronto conference the Sustainable Development movement had a new flagship cause. That this propelled climate protection to prominence, there can be no doubt. But there would be a price to pay. After launching the Framework Convention on Climate Change (FCCC) at the Rio ‘Earth Summit’ in 1992, the institutions previously established by the UN to save the climate then also took on the development goals of that summit. The trouble was not only that these goals sat awkwardly with the IPCCs scientific objectives. They also legitimated the efforts of some poor country delegations to transmute the climate negotiations into negotiations for development aid. The organisers of the Toronto conference could never have anticipated the course of its influence, but yet they were not short on ambition. They drafted a conference statement bulging with alarming claims on a variety of threats, and these were paired with demands for immediate and suitably drastic policy responses. On greenhouse warming, the statement called for the rich industrialised countries to stabilise carbon dioxide emissions at 1988 levels by 2000. By 2005 they should each reduce emissions by 20%. This ‘Toronto Target’ became the policy goal of the greenhouse movement leading into the Rio conference in 1992. But then, while the FCCC still lacked a protocol, this 20% reduction target persisted as the headline policy goal right up until Kyoto in 1997. The importance of Toronto to the greenhouse scare, to both its character and its success, can hardly be over stated. But this is not to say that this breakthrough came entirely out of the blue. It came after a long and sometimes lonely campaign by a small group of scientist-activists following the (first) World Climate Conference of 1979. At that meeting much was made of the warming threat. The trouble was that the meteorological establishment did not want to know about it. This was especially true of the World Meteorological Organization (UN WMO) and its World Climate Research Programme, where key players worked hard to resist all attempts to give this issue any special attention. Indeed, if it weren’t for the persistence of a few scientists, there would never have been Toronto. The campaign for greenhouse policy action was ably led by the Executive Director of the UN Environment Programme, Mustafa Tolba. He launched it at a now-famous meeting of selected scientists convened in the Austrian town of Villach in 1985. The plan for the Villach meeting was to achieve a consensus on the scientific basis for policy action, and that is what it duly delivered. Even still resistance continued. But the scientist-activists maintained momentum with funding via Tolba and from the Swedish Monarchy and the Rockefeller Brothers—who supported the development of policy response options at two workshops to be convened late in 1987 (the ‘Villach-Bellagio’ workshops). This policy entrepreneurism fed rising concern among country delegates that the WMO leadership found hard to ignore at its World Meteorological Congress, May 1987. Following a discussion of the Villach consensus, a compromise was reached: there would be a new assessment, this time by an intergovernmental panel, the IPCC . This was all before Toronto. After Toronto, while the IPCC was compiling its report, tremendous public excitement was generated, not the least by two ministerial-level international conferences in Europe during 1989. Political will for immediate action to ‘save the climate’ grew so strong, that the outcome of the IPCC assessment hardly mattered. Indeed, its report released in 1990 was decidedly subdued, with a distinct lack of empirical evidence found to support the model predictions. Not that anyone in the policy arena seemed to care, and the treaty negotiations went ahead as planned. Howard Ferguson (1930-2015) speaking in Toronto. Ferguson was one of the Canadian scientist-activists who were instrumental in bringing the greenhouse scare onto the global political stage during the late 1980s. That the greenhouse scare had been launched in Canada was no accident. Canada’s dependence on fossil fuels was relatively low with their vast hydroelectricity resources and then their recent shift to nuclear power. Canada also had a special connection with the Sustainable Development movement through its Canadian patriarch, Maurice Strong. Strong was the first Executive Director of the UN Environment Programme before handing over to Tolba in 1974. He continued to be active, and active on this issue, up until the Rio ‘Earth Summit’ (1992) and beyond. But during the mid-1980s a whole new contingent of Canadians came forward to actively promote this one new cause. They were led by Jim Bruce, head of the Canadian delegation to the WMO. He almost singlehandedly pushed the WMO into taking a lead on the issue. In 1986, after chairing the Villach Conference, Bruce moved to Geneva, where he coordinated WMO activities on climate protection. Also prominent among Canadian scientist-activists was the meteorologists Howard Ferguson. He was on the steering committee of the Villach-Bellagio policy workshops, and he went on to coordinate preparations for the second World Climate Conference (scheduled for 1990). These and other Canadians had the ear of the Mulroney government, especially though its enthusiastic environment minister, Tom McMillan. Jim Bruce, the Canadian meteorologist who swung the WMO around in support of the climate scare.
. . . it is established beyond doubt that we will experience a global change in climate. . .The impact of climate change may be greater and more drastic than any other challenges that mankind has faced with the exception of the threat of nuclear war. The best predictions available indicate potentially severe economic and social dislocation for present and future generations, which will worsen international tensions and increase risk of conflicts between and within nations. It is imperative to act now. With the conference statement packed with so many scary scenarios based on what the meteorological establishment regarded as, at best, flimsy speculative science, it must be asked why there was not an outcry from all those meteorologists present at Toronto. In fact, to some extent the resistance continued at the final plenary where the statement was to be agreed. The small group assigned to draft the conference statement was led by Stephen Lewis, a Canadian politician and broadcaster who was then ambassador to the UN. It was only at this final plenary that the majority of scientists and other delegates got a chance to read it. During the discussion a number of meteorologists raised concerns that they had been asked to endorse without proper debate very strong assertions of alarm that they did not find sufficiently grounded in science. One of these protesters was the Third Vice President of the WMO and the head of the UK Met Office, John Houghton. Another was the First Vice President of the WMO and the head of the Australian Bureau of Meteorology, John Zillman. Their appeals were to no avail—the outrageous scientific claims were not weakened. Houghton and Zillman could only go on to ensure that the IPCC assessment remained true to the science (which it did, at least for the first assessment). … a sense of being swept along in a tide driven more by the Canadian political agenda and emotions born of the contemporary North American drought than by strongly objective assessment of the scientific evidence and arguments. . .
At Toronto, political enthusiasm drowned out the voice of sciences. After that, the science became an inconvenient obstacle to policy action—an obstacle that a new generation of scientist-activists would soon be working hard to overcome. 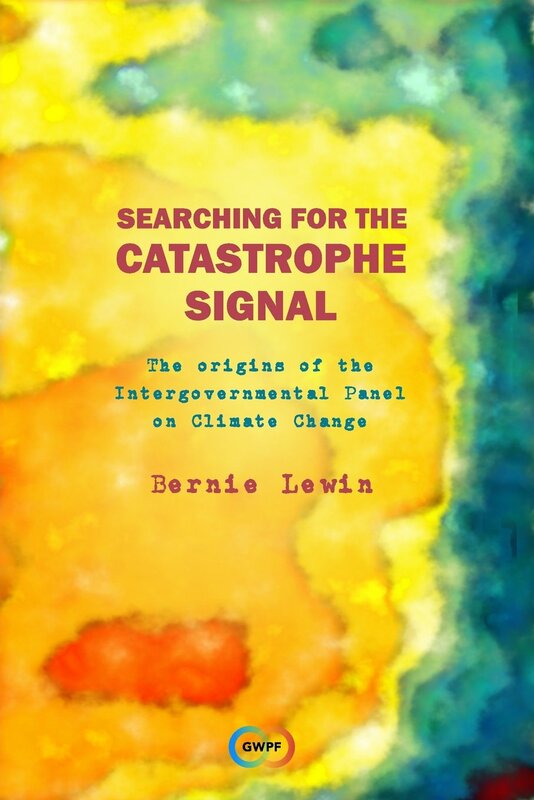 For more detail and comprehensive referencing see Searching for the Catastrophe Signal. This entry was posted in Climate Change Science, History of Climate Science, Politics of Climate Science and tagged Changing Atmosphere Conference, Gro Brundtland, Howard Ferguson, Jim Bruce, Mustafa Tolba, Sustainable development, Tom McMillan, Toronto, Toronto Target. Bookmark the permalink. Toronto the largest of Canada’s 3 as#holes, along with Vancouver and Ottawa the source for horrible ideas for over a century. You might be interested in this post and the linked refereed paper- which I humbly suggest marks the end of the dangerous global warming scam if widely disseminated.I think the millennial cycle is obviously the chief climate modifier of the late Holocene cooling trend over the last two thousand years .The consensus model forecasts are inherently useless. They make the schoolboy error of using too small a sample size ie 150 years or less when the main cycle is millennial. Their forecasts will therefore fall outside the real world outcome. This is error is compounded by projecting their forecasts straight ahead beyond the Millennial Turning Point in temperature at 2003/4 +/-. This correlates with the solar activity peak at 1991+/- – the delay is due to the thermal inertia of the oceans.A simple heuristic method using the 60 and 1000 year cycles and honoring the Millennial peak is all that is needed to provide useful advice to policymakers. This paper argues that the methods used by the establishment climate science community are not fit for purpose and that a new forecasting paradigm should be adopted. Earth’s climate is the result of resonances and beats between various quasi-cyclic processes of varying wavelengths.It is not possible to forecast the future unless we have a good understanding of where the earth is in time in relation to the current phases of those different interacting natural quasi periodicities. Evidence is presented specifying the timing and amplitude of the natural 60+/- year and, more importantly, 1,000 year periodicities (observed emergent behaviors) that are so obvious in the temperature record. Data related to the solar climate driver is discussed and the solar cycle 22 low in the neutron count (high solar activity) in 1991 is identified as a solar activity millennial peak and correlated with the millennial peak -inversion point – in the RSS temperature trend in about 2003. The cyclic trends are projected forward and predict a probable general temperature decline in the coming decades and centuries. Estimates of the timing and amplitude of the coming cooling are made. If the real climate outcomes follow a trend which approaches the near term forecasts of this working hypothesis, the divergence between the IPCC forecasts and those projected by this paper will be so large by 2021 as to make the current, supposedly actionable, level of confidence in the IPCC forecasts untenable. Feel free to post any of this material on your blog.